Oral Health : Aloe Vera Better Than Toothpaste? Properly handled aloe vera used as a tooth cleaner may help fight germs, a researcher in India says. The study, published in General Dentistry, finds the aloe vera tooth gel just as effective as -- and in some cases, more effective than -- two popular commercial non-aloe tooth cleaners. The researchers say aloe latex contains anthraquinones -- chemical compounds used in healing and arresting pain because they are anti-inflammatory in nature. Since aloe vera tooth gel tends to be less harsh on teeth because it does not contain the abrasive elements typically found in commercial toothpaste, the researchers say it may a great alternative for people with sensitive teeth or gums. However, they say, buyers must beware. 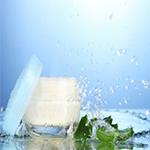 Products must contain the stabilized gel that is located in the center of the aloe vera plant in order to be effective. Products must also adhere to certain manufacturing standards. "Aloe must not be treated with excessive heat or filtered during the manufacturing process, as this destroys or reduces the effects of certain essential compounds, such as enzymes and polysaccharides," study co-author Dilip George of Pushpagiri College of Dental Sciences, Tiruvallam, India, says in a statement.